Make your data visualizations and dashboards more engaging with Radial Gauges that show off KPIs with rich style and interactivity. The round and semi-round gauges are powerful, easy to use, and highly configurable to present dashboards capable of displaying clocks, industrial panels, automotive dashboards, and even aircraft cockpits. 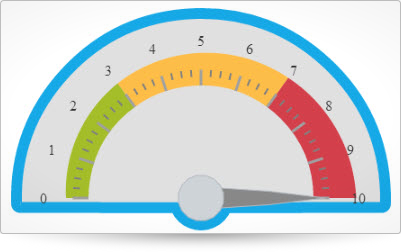 The Ignite UI Radial Gauges are compatible with the NucliOS (for native iOS) and XAML (WPF and Silverlight) versions of the Gauge, offering visual and functional parity on multiple platforms. The following code snippet demonstrates how to initialize the igRadialGauge. Gets or sets the brush to use to fill the backing of the gauge. backingBrush: "rgba(236, 237, 239, 1)"
Gets or sets the corner rounding radius to use for the fitted scale backings. Gets or sets the inner extent of the gauge backing. Gets or sets the outer extent of the gauge backing. backingOutline: "rgba(236, 237, 239, 1)"
Gets or sets the over sweep angle to apply to the backing if it is displaying fitted (in degrees). Must be greater or equal to 0. Gets or sets the type of shape to use for the backing of the gauge. Gets or sets the x position of the center of the gauge with the value ranging from 0 to 1. Gets or sets the y position of the center of the gauge with the value ranging from 0 to 1. Gets or sets the strategy to use for omitting labels if the first and last label have the same value. font: "rgba(236, 237, 239, 1)"
fontBrush: "rgba(236, 237, 239, 1)"
Gets or sets the position at which to put the labels as a value from 0 to 1, measured form the center of the gauge. Values further from zero than 1 can be used to make this extend further than the normal radius of the gauge. minorTickBrush: "rgba(236, 237, 239, 1)"
Gets or sets the position at which to stop rendering the minor tickmarks as a value from 0 to 1, measured from the center of the gauge. Gets or sets the position at which to start rendering the minor tickmarks as a value from 0 to 1, measured from the center of the gauge. Gets or sets the extent of the feature which is closest to the base (e.g. a bulb) with a value from -1 to 1. Note: Only some needle shapes respect this property. Gets or sets the width of the needle at its feature which is closest to the base (e.g. a bulb) with a value from 0 to 1. Note: Only some needle shapes respect this property. Gets or sets the brush to use when rendering the fill of the needle. needleBrush: "rgba(236, 237, 239, 1)"
Gets or sets the extent (from -1 to 1) at which to end rendering the needle, measured from the center of the gauge. Gets or sets the width of the needle at its point using a value from (0 to 1). Note: Only some needle shapes respect this property. Gets or sets the brush to use when rendering the outline of the needle. needleOutline: "rgba(236, 237, 239, 1)"
Gets or sets the brush to use for filling the needle cap. Note: this only applies to certain cap shapes. needlePivotBrush: "rgba(236, 237, 239, 1)"
Gets or sets the width of the inner cutout section of the needle cap with a value from 0 to 1. Note: Will only take effect if you have a cap set on the needle that has a cutout section. Gets or sets the brush to use for the outlines of the needle cap. needlePivotOutline: "rgba(236, 237, 239, 1)"
Gets or sets the shape to use for the needle cap. Gets or sets the width of the cap of the needle with a value from 0 to 1. Note: Will only take effect if you have a cap set on the needle. Gets or sets the extent of the feature which is closest to the point (e.g. the tapering point of a needle) with a value from -1 to 1. Note: Only some needle shapes respect this property. Gets or sets the width of the needle at its feature which is closest to the point (e.g. the tapering point of a needle) with a value from 0 to 1. Note: Only some needle shapes respect this property. Gets or sets the shape to use when rendering the needle from a number of options. Gets or sets the extent (from -1 to 1) at which to start rendering the needle, measured from the center of the gauge. Gets or sets the multiplying factor to apply to the normal radius of the gauge. The radius of the gauge is defined by the minimum of the width and height of the control divided by 2.0. This introduces a multiplicative factor to that value. Gets or sets a collection of brushes to be used as the palette for gauge ranges. Gets or sets a collection of brushes to be used as the palette for gauge outlines. Gets or sets the scale ranges to render on the linear gauge. Gets or sets the brush for the entire range. Gets or sets the ending value of the range. Gets or sets the ending value of the inner extent of the range. Gets or sets the starting value of the inner extent of the range. Gets or sets the ending value of the outer extent of the range. Gets or sets the starting value of the outer extent of the range. Gets or sets the brush for the outline of the range. Gets or sets the flag used to determine if the range should be removed. If set to true, the range (if existing) is removed. Gets or sets the starting value of the range. Gets or sets the thickness of the range outline. Gets or sets the brush to use to fill the background of the scale. scaleBrush: "rgba(236, 237, 239, 1)"
Gets or sets the end angle for the scale in degrees. Gets or sets the position at which to stop rendering the scale as a value from 0 to 1 measured from the center of the gauge. Gets or sets the extra degrees of sweep to apply to the scale background. Must be greater or equal to 0. Gets or sets the over or shape to use for the excess fill area for the scale. Gets or sets the start angle for the scale in degrees. Gets or sets the position at which to start rendering the scale, measured from the center of the gauge as a value from 0 to 1. Gets or sets the direction in which the scale sweeps around the center from the start angle to end angle. tickBrush: "rgba(236, 237, 239, 1)"
Gets or sets the position at which to stop rendering the major tickmarks as a value from 0 to 1, measured from the center of the gauge. Gets or sets the position at which to start rendering the major tickmarks as a value from 0 to 1, measured from the center of the gauge. Gets or sets the number of milliseconds over which changes to the gauge should be animated. Gets or sets the easing function used to morph the current series. Gets the transition progress of the animation when the control is animating. Gets or sets the value at which to point the needle of the gauge. // Get reference to igRadialGauge. // Get the the ending angle of gauge scale. // Get the value on the gauge scale associated with the label. // Get the X offset of the label on the gauge scale. // Get the Y offset of the label on the gauge scale. Adds a new range to the radial gauge. Clears the ranges in the radial gauge. Exports the visual data for the radial gauge. Gets the point on the gauge for a given scale value and extent. The value for the main scale of the gauge. Gets the value for the main scale of the gauge for a given point within the bounds of the gauge. Returns true if the main gauge needle bounding box contains the point provided, otherwise false. Scales a value on the gauge's main scale to an angle around the center point of the gauge, in radians. Returns true if the style was updated for the radial gauge. Unscales a value from an angle in radians to the represented value along the main scale of the gauge. Get the class applied to main element: ui-radialGauge ui-corner-all ui-widget-content. Get the class applied to main element, shown when the radialGauge is opened in a non HTML5 compatible browser.